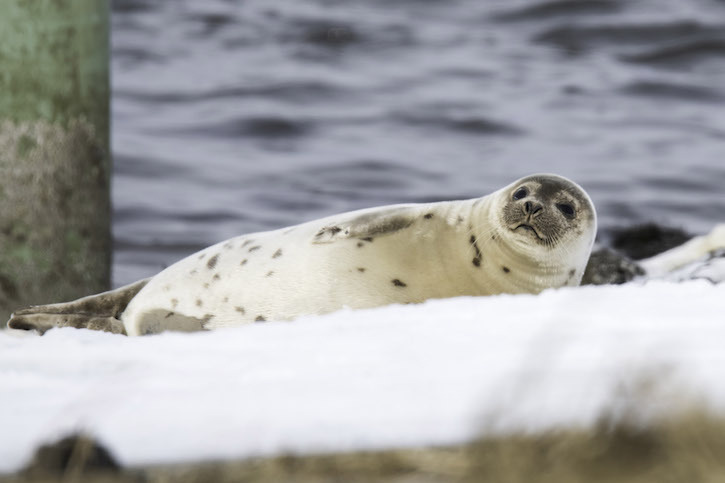 Posted on March 3, 2019 by David M.
It was bitter cold, but sunny, for our outing this week, and a small but hardy group showed up to join me and Dave Weaver for Wednesday Morning Birding. The Parker River National Wildlife Refuge road is closed beyond Hellcat, so we started our excursion at Salisbury Beach State Reservation. Even though the marsh was empty and frozen, we found plenty of ducks near the boat ramp, perhaps in greater numbers due to the flats being covered by ice. American Black Ducks and a few Mallards huddled at the edge of the frozen marsh. White-winged Scoters, Greater Scaup, and a Red-breasted Merganser or two lounged in the creek, while more scoters and some Common Goldeneyes rested on the river. Stopping to look at the rocks along the river bank, we found several little groups of Gadwalls dabbling and exploring around the rocks, along with a big raft of Common Eiders and more scoters foraging along the eddy lines in the river. A few Long-tailed Ducks and Black Scoters flew by as well, and a Red-throated Loon, which have been scarce this year, floated out with the tide. At Salisbury Beach, we found an ocean that looked quite empty, until we saw another Red-throated Loon and the usual raft of sea ducks off the end of the north jetty. Gulls sat rather than stood in the parking lot, conserving heat carefully. This unremarkable result sent us back to Plum Island. We bypassed the many Canada Geese and American Black Ducks in the river along its south bank at Joppa Flats. From the Plum Island bridge, we noticed a young Bald Eagle soaring over the Plum Island River, then found three more sitting on a large tree that had washed up on the marsh. When one of the eagles took off to tussle with another in the air, another young eagle joined the group, making a total of four subadult birds and one adult all at once! After that record-breaking mini Eagle Festival, we walked away from the wind, up the parking lot #1 boardwalk, and down a few steps from the dune platform to get out of the breeze. As often happens, the sea looked empty, but birds appeared with closer inspection. 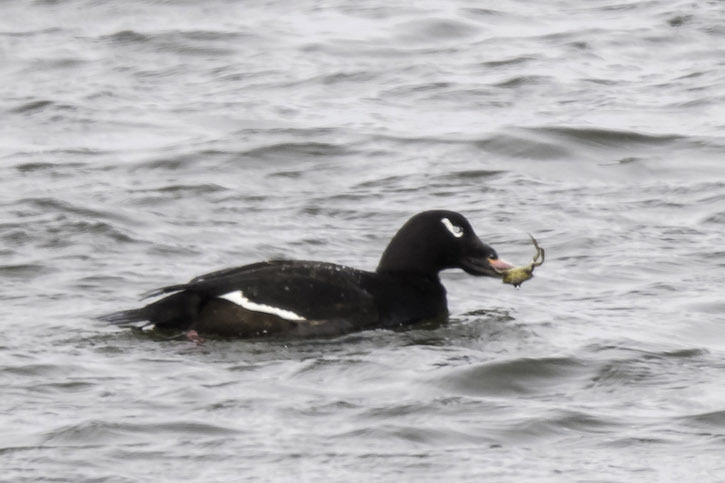 There were lots of scoters far out, and now and then we would see the white on the wings of one, or a big orange knob on the face to identify the bird as a Black Scoter. A Horned Grebe eventually came into view, then a Common Loon. We turned our faces to the frigid wind and squinted our way back to the wonderfully sheltering vans. Hoping for an owl or even a hawk to look at, we made our way to The Warden’s as that was all the time we had left. 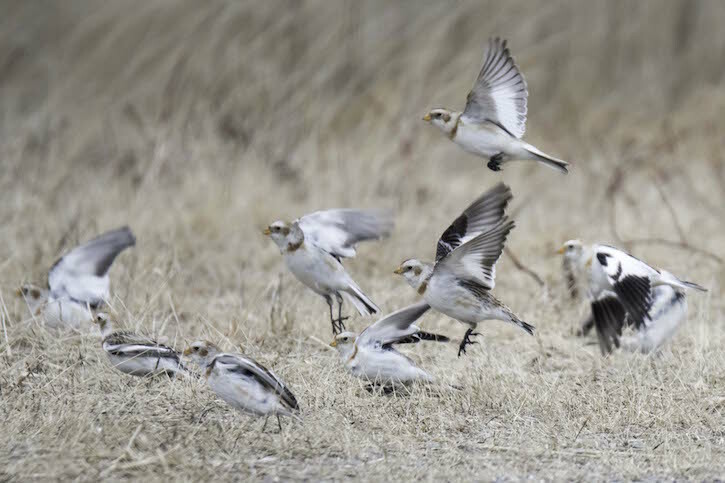 We were delighted, therefore, to find a flock of Snow Buntings vigorously feeding on grist and maybe little seeds along the side of the road near the S-Curves. The sight of winter seed eaters gathering on the roadsides is a striking feature of the season, and you never know if such a flock will contain something uncommon or even rare. These were purely beautiful SNBUs. At The Warden’s, we faced another short march into the wind, but it was the last one, so off we went. There was little avian activity, but another small flock of Snow Buntings was skittishly alighting on the roof of one of the sheds, dropping onto the ground, flying off in a panic, and repeating the whole process. And that was it for a bitter cold day, where we confirmed our ability to withstand the elements for a little while, and were rewarded with a few brilliant moments with birds. Northern Pintail (1) – drake with black ducks. 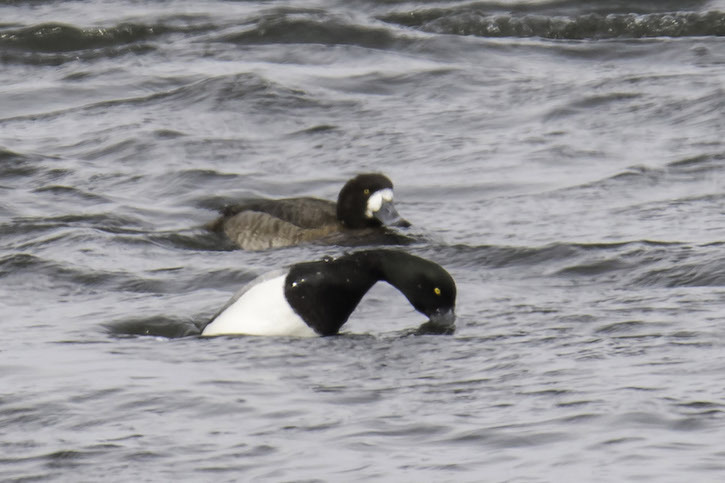 Greater Scaup (3) – 2 drakes, 1 hen; boat ramp. Red-tailed Hawk (1) – cedar grove. Common Eider – common; one ocean. White-winged Scoter – common; one ocean. Black Scoter (4) – one ocean. Scoter spp. – many; one ocean. Long-tailed Duck (2) – pr; one ocean. Common Loon (1) – one ocean. Horned Grebe (1) – one ocean. 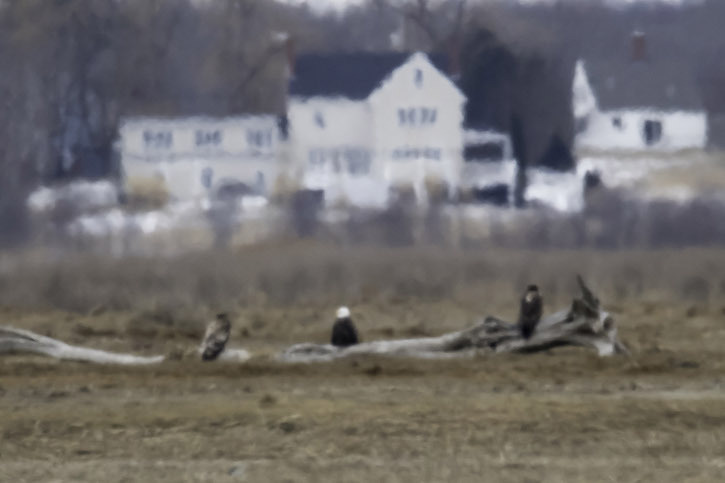 Bald Eagle (5) – 1 ad, 4 imm; hay marsh, n refuge gate; latter interacting. Northern Harrier (2) – 1 at distance over North Marsh; 1 ad female over marsh w pannes. American Crow (3) – hay marsh. Black-capped Chickadee (1) – S-curves. Snow Bunting (~ 33) – ~ 25 roadside, n S-curves; 8, The Warden’s. This entry was posted in Birding on March 3, 2019 by David M..